Back from family holiday so postings will now resume. 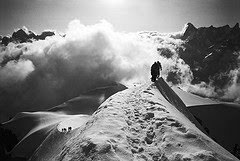 There are some black and white photos of climbing trip to Alps in July here. I have to finish the OUP Very Short Introduction To Humanism by end November so shall be posting bits here for comment over next couple of months. After that I am writing a book on religious and other varieties of "intellectual black hole" for Prometheus Books in the US. Great photos! Good to have you back. This week was A C Grayling & Richard Harries on values, with a visit to a faith school and Camp Quest - you can get the episode from the website. Next week it's Julian Baggini's turn. I think you've been asked this question somewhere in a previous thread but I am going to repeat it. What camera, lens, etc. are you using? I'm going to buy one. Your shots are incredible.